When it comes to you or your companions’ lively hood you need to know what to do in every situation. You could have the best gear possible in your survival kit, but if you don’t know how to use them then what’s the point? Below is a list of the best survival books everyone should read and study before heading to the backcountry. 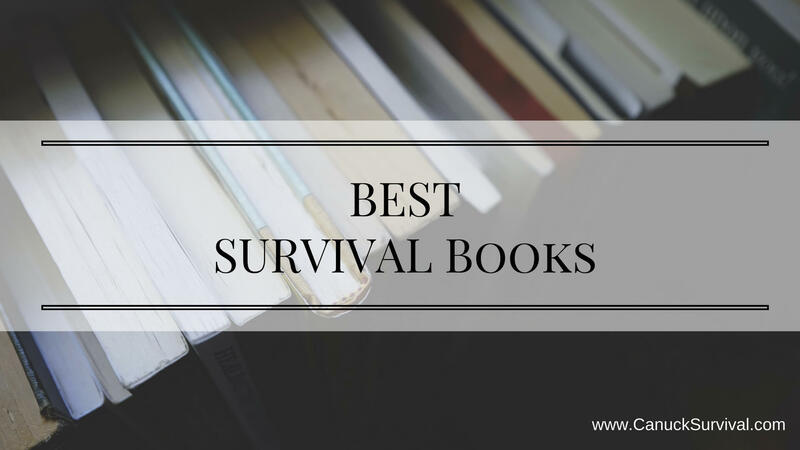 This list of the best survival books is more geared for survival in the wilderness and not so much in the urban environment. These are in no particular order and some topics will overlap, but that’s not a bad thing. The more ways you know how to do one thing the better you can adapt your techniques to the situation. There are many more books available on the survival subject so let this guide serve you as a starting point. This is a Canadian adapted version of the original best-selling Outdoor Life book. It’s nice to see us Canadians getting some love, so of course it’s on the list. The Ultimate Survival Manual covers a huge array of topics. This includes your essentials, wilderness, disaster, and urban survival situations. The book is filled with clear, concise instructions, helpful diagrams, essential checklists, and inspirational first-person stories, this book is a fascinating armchair read that could potentially safe your life. Although Outdoor Life calls it the “Ultimate” manual, this book will serve as a great coffee table read for everyone to enjoy and learn from. Get a sneak peak inside the book at Amazon. It’s available in hardcover, paperback, and for the Kindle. Survive! is written by Survivorman, Les Stroud. You can’t get any more Canadian than this guy. Survive! comes in hardcover, paperback, and Kindle format. Les uses his experiences from traveling on 6 continents using field-tested techniques to create this book and earn its right on the Best Survival Books list. Definitely a must read before heading into the wild. Check it out on Amazon. Bushcraft 101 at the time of this article is an Amazon bestseller and also a New York Times bestseller in the Sports and Outdoors category. It’s authored by Dave Canterbury who co-starred on Dual Survivor for a couple seasons. He’s now the co-owner and supervising instructor at the Pathfinder School in Ohio. Pathfinder School was named by USA Today as one of the Top 12 Survival Schools in the United States. He is also the managing editor of Self Reliance Illustrated magazine. His YouTube channel has more than 400,000 subscribers and his videos have more than 34 million views. His work has also been published in New Pioneer and American Frontiersman, in short he’s a man with a great deal of knowledge. This is an updated version of the original SAS Survival Guide by John ‘Lofty’ Wiseman, a former SAS member. The update adds information in regards to surviving in an urban environment, which more and more people will need as cities expand and we lose touch with nature, unfortunately. Preparation – Understanding and assembling the latest and most resilient kit. Navigation – Skills, technologies, and techniques to get you through unfamiliar terrain. Food and Health – Finding resources in your environment, feeding yourself, healing yourself, and avoiding disease. Urban Safety and Security – Recognizing dangerous situations, defending yourself, and saving others. 100 Deadly Skills was written by retired SEAL Team member Clint Emerson. It features 100 skills are not necessarily deadly, so don’t think this is a book on 100 ways to kill something. Some of the ideas in the book you may never use, like how to fight a shark or run from a wild boar. Scan through the table of contents don’t worry about the things you’ll never need to know, and study the rest. You’ll discover why preparation is the most important thing, to how to find water, and even how to use household items has weapons. Something you hopefully won’t have to encounter, but good to know nonetheless. Readers have commented that it’s a fun and helpful read that should be in everyone’s library. Another book by Dave Canterbury, Advanced Bushcraft is a more advanced version of Bushcraft 101, could you tell by the name? This book goes into detail on surviving with little no tools. Dave covers crucial survival skills such as tracking to help you get closer to wildlife, crafting medicines from plants, and navigating without the use of a map or compass. He also offers ways to improvise and save money on bushcraft essentials. The idea behind Canterbury’s advice and guidance is so you can learn how to forgo your equipment, make use of your surroundings, and truly enjoy the wilderness. This book is great for those already somewhat experienced or anyone looking to advance their skills. I wouldn’t recommend it for beginners, but definitely have it on your must buy list for later. Another from Dave Canterbury’s lineup, The Bushcraft Field Guide focuses on food. Dave teaches how to trap, gather, and cook in the wild (as the title suggests) and provides recipes to do so. Of course you probably won’t be carrying most of the ingredients, but hey, it can be useful in the kitchen too. One of the great things about this book are the full colour photos of plants to forage and which ones to avoid. My old books growing up had hand drawings that didn’t help me much, so this is a nice change. When you know you’ll be in the woods a while, or even a few nights, this guide will come in handy to ensure you bring the proper supplies and ingredients so you can spend less time scavenging for food and more time enjoying the wilderness. Written by Mors Kochanski, the third edition book comes with updated colour photos to teach you practical skills and knowledge essential for surviving and enjoying the wild. Bushcraft includes basic instructions for lighting and maintaining a fire, chopping wood and felling trees, creating a warm shelter, using knives and axes safely, finding plants and animals important for survival, cooking in the outdoors, and making tools, ropes, and so much more. Add this to your lineup of beginner survival guides and you’ll be set. The Knot Tying Bible is an important guide to have, even in everyday normal life. You never know when you’ll need to tie a knot and as crazy as it sounds you’ll be able to impress people with your knot tying skills! In this book you will learn everything from tying knots to haul logs, securing a canoe, even to wrapping a present. This book is great for beginners and experienced rope users who can enjoy new knot challenges and discoveries. Knowing the right knot to use and how to tie it can make life easier and safer. The Knot Tying Bible is a timeless resource and an essential purchase. You won’t realize how important learning different types of knots is until you’re in a situation you need them. Another by Mors Kochanski, this Kindle only book teaches you one of the most important skills, building shelter. Mors gets to the point and shows you what you need, how to do it, and the physics involved. I hope you enjoyed this list, and as I said above there are waaayyy more books and resources available. Any of the above will be a great resource to have in your library. When it comes to knowledge you can never have too much, and no one can take that from you. Do you already own one of these books or have another favourite? Let me know in the comments below! Keep studying and stay prepared my friends!